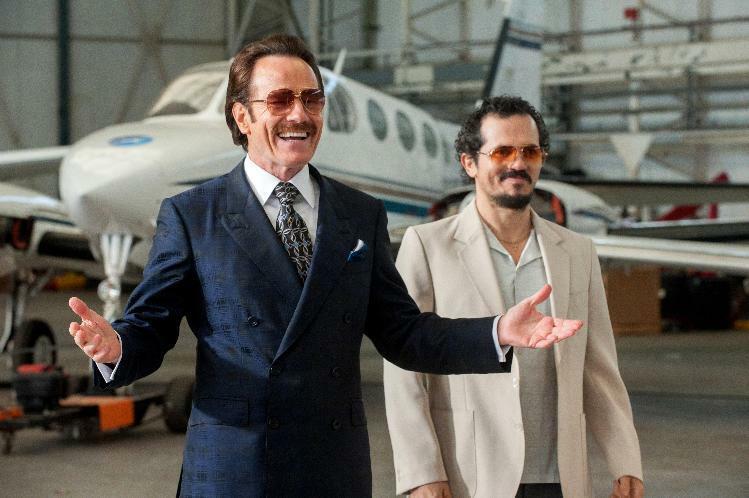 The true story of an undercover customs agent who infiltrated Pablo Escobar’s drug trafficking ring in the mid-1980s is given the big screen treatment in “The Infiltrator,” the latest in a series of forgettable drugs are bad / cops are good movies. The story of Robert Mazur (Bryan Cranston) is a fascinating one; too bad it’s dragged out in this dull, generic movie. (Don’t worry, the movie will still have you reaching for your iPhone to Google the man because the truth is always stranger than fiction). Some of the most compelling content is the exploration of how Mazur’s family deals with his secret identities and the toll that a life undercover can take on your own psyche. I wanted more of that aspect of the story but instead I got repetitive meetings with drug lords and businessmen and long speeches about money laundering. Most of the good stuff is early on, so the story eventually outstays its welcome in the laggy third act. The movie is decently (but a little clunkily) directed by Brad Furman, the slick soundtrack is killer good, and Joshua Reis’ cinematography is appropriately gritty and atmospheric. It goes without saying that the acting is top-notch; Cranston is at the top of his game as always, as is John Leguizamo (as fellow agent Emir Ebreu). Rounding out the excellent performances are Diane Kruger (Mazur’s undercover fake fiancee Kathy Ertz), Amy Ryan (as boss Bonni Tischler), and Benjamin Bratt (as Escobar’s right hand man Roberto Alcaino). All of the performances are intense, as are certain elements of the storytelling (there’s quite a bit of tension and several situations that had me gripping the armrest). The problem is that the elements never seem to mesh well and the result is a movie that blends into other drug movies. There’s nothing original that truly stands out. “The Infiltrator” is a worthy rental but it doesn’t live up to the heights of similar fact-based films like “American Hustle” and “Argo.” The movie isn’t bad, it’s simply forgettable. Matt was unavailable for review. Nice review. Personally, the movie was good, but it wasn’t the greatest. The acting was great as well as the soundtrack and even the “look” and “feel” of the movie. However, even it was based on a true story, it felt like a standard crime / drug drama with the commonplace clichés. Still, definitely worth watching. Leguizamo is fantastic in everything he does, whether he’s on the screen for five minutes or fifty.